Journeys into the exotic east are nothing new in slots land, whether it’s the lush Asian world of Golden Lotus from RTG or Aristocrat’s popular Wild Panda slot. Paradise Found or Paradise Lost? 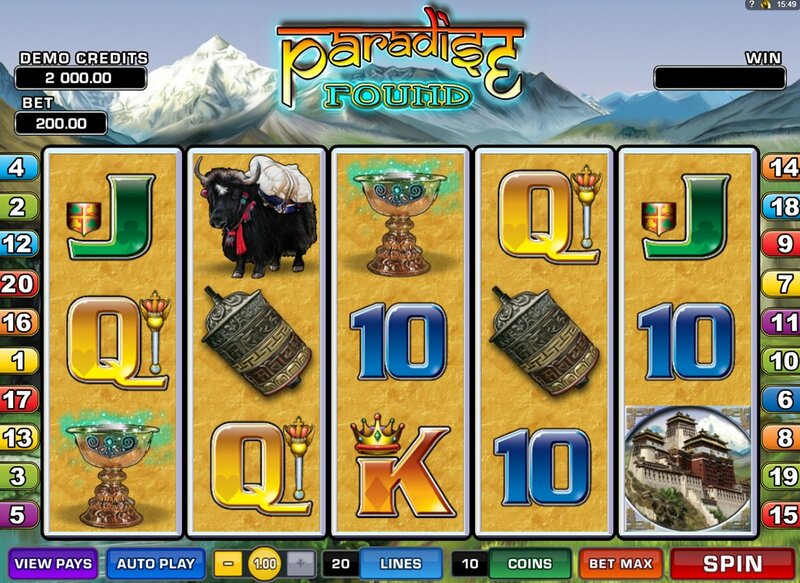 Online casino slot game developer Microgaming take a trip into the magical Himalayas with their 5 reel slot, Paradise Found. The question remains if you will end up discovering paradise by playing this game. First impressions never really go far in terms of slots but the initial impression I had of this slot was that it appears visually appealing and the theme might be considered safe by some people but is a popular one. Would the game play match my early judgments? The big feature of Paradise Found is hit by the Lotus Wild symbol. It substitutes for all symbols on the reels other than the Traveler and Temple icons, but bear in mind that it only appears on reels 1 and 5. However, when it appears on reel 1 at the same time as the Temple Scatter appears on reel 5, the Wild Lotus feature will begin. When the Wild Lotus feature is triggered, the reels are held. One symbol position on reels 2, 3 or 4 will randomly turn in to a Wild Lotus symbol during each of the 10 free spins, and award any wins. It’s a nice little feature, but it’s worth remembering that’s it pretty tricky to hit these two icons simultaneously, especially as the Temple Scatter only appears on reel 5. So, let’s look at the reels. As well as some pretty Asian-themed 10-through-Ace symbols, there are the aforementioned Wild and Scatters, buffaloes and prayer wheels. And with betting starting at just $0.01, and 20 pay-lines to hit, there’s plenty of chance to win big. The beauty of Tibet and the Himalayas has brought Western explorers hunting out adventure for centuries, so it’s a case of evolution that online slots developers are the latest to make the trip. 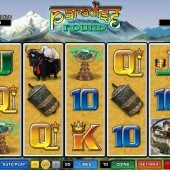 Enjoy the simple pleasures of Paradise Found and the solid credentials of Microgaming.